Since we spent all these days at the Black Sea, it makes sense to lump them together. 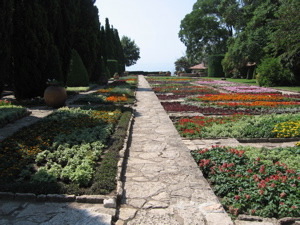 We headed to Albena, a resort at the Black Sea by plane. We got to the airport nice and early and had an easy check-in. And then we waited and waited and…waited. First in one area and then in another. But at last we made it on to the plane, flew, and landed nice and safely in Varna. Mark’s partner has a friend who is a pilot and just happened to be landing in Varna at the same time. 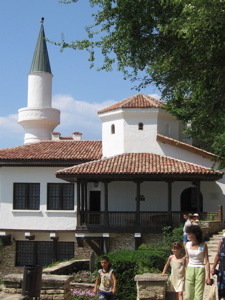 So he picked us up and drove us to Albena, which is about 30 kilometers away. Good to have friends, I say. I should mention here that it was raining. And not just a drizzle or a trickle. Oh no. RAINING. 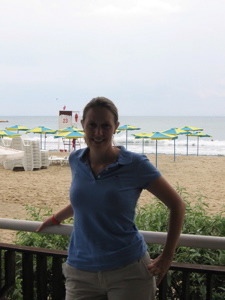 On our much anticipated trip to the Black Sea, we were caught in a rainstorm. Blech. It stopped once we got there, but I was a bit sleepy…because I don’t do gray weather in July. Hello……I am from San Diego. So I took a nap while Mark and Linda went for a walk around town. When I woke up it was a little bit sunny and everyone else was…asleep. So I went outside to the rows and rows of umbrellas and did some good people watching. After everyone woke up and got cleaned up, we headed to dinner, which was a buffet. There was some, ummmm, interesting food there, but we were each able to find at least one or two things we could eat. I will say here that the sea, the sand, and the town were awesome, but the food, well….that is not the strong point of this place. We ate, hung out, and went to bed. Not as much rain on this day. We were able to spend the morning out under an umbrella and in the sea water. Mark and I realized that this was the first time we had swam in a sea, not an ocean. Kinda cool. We all read, lounged, napped, and swam all morning. Then, after lunch, we headed into the little town and cruised the streets. Mark found a crazy magnet and bought it and Linda bought some goods to take home. We spent the evening eating dinner and playing cards in an ongoing tournament. A very relaxing day. Linda trying to act all shy. 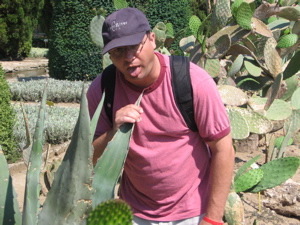 Mark in the cactus garden. 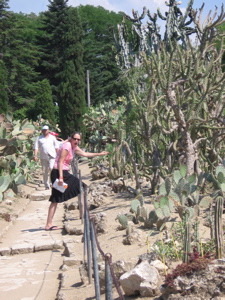 Me in the cactus garden. 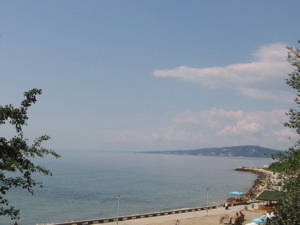 View of the Black Sea on the way back from Balchik. It was hot. 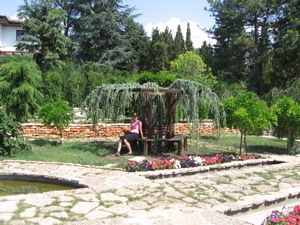 I needed a rest in the shade. 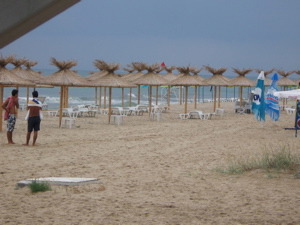 After the morning at Balchik, we headed back to Albena and hung out on the beach in the afternoon. Mark and Linda had massages, but I just could not leave my sandy locale. It was sooooooo comfy and just my kind of place. So I stayed. I met up with them around dinner. Again we ate and played cards. Then we went back to our rooms and prepared to leave. 🙁 It was a nice weekend. Sad to leave. Also known as the day of the long train ride. I had decided that we should ride the train back because Bulgaria has a lot of beautiful scenery and the only way to see it (if you don’t have a car….and we don’t) is by bus or train. We had our own little compartment, so it wasn’t too bad. But the bathrooms left a lot to be desired. Really. They did. But we did see some beautiful mountains and rock formations. We made it back in Sofia in the early afternoon and had time to do some laundry and have a nice meal. The next day, both Linda and I left–she to go home and me to go on my Amazing Race. We had a nice week together. It was really great to have another English speaking companion here. 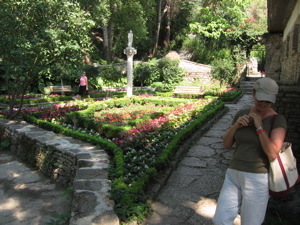 I hope Bulgaria did not scare her off too much, though I am sure it does not quite compare to the south of France…..